The LT has been part of a combined campaign to monitor an unprecedented double supernova which exploded for its second time last October in distant galaxy UGC4904. A global collaboration of astronomers, led by Queen's University Belfast teamed up with Japanese supernova hunter Koichi Itagaki to report their results, published today in Nature. Both explosions, previously thought to be from two separate objects UGC4904-V1 and SN2006jc, were in fact due to the same object, and that it was also one of the heaviest stars known to exist. This is the first time such a double explosion has been observed, and it challenges our understanding of star-deaths. Time sequence of transient explosions: (a) Archive image of galaxy UGC4904; no transient is visible. (b) First burst: detection of 18th-magnitude UGC4904-V1 by Koichi Itagaki. (c) Interim period: Nothing visible again. (d) Second burst: 13th magnitude supernova SN2006jc. In 2004 Koichi Itagaki discovered an exploding star in the galaxy UGC4904 (78 million light years away in the Lynx constellation), which rapidly faded from view in the space of 10 days. It was never formally announced to the community, but then he then found a new much brighter explosion in the same place only two years later in 2006, which he proposed as new supernova. Queen's astronomers Prof. Stephen Smartt and Dr. Andrea Pastorello immediately realised the implications of finding two explosions at the same position on the sky. 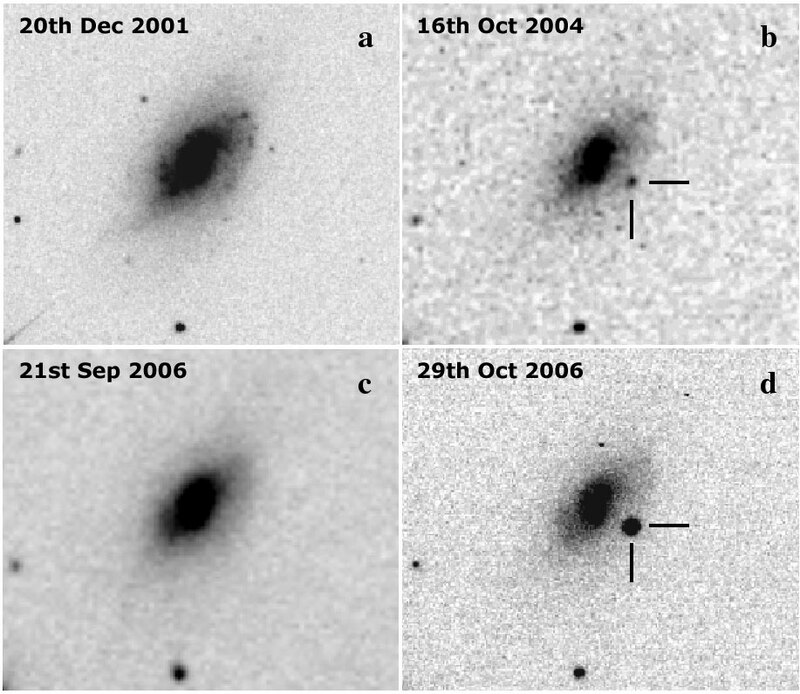 They began observing the 2006 supernova (named SN2006jc) with a wide range of large telescopes and analysed Itagaki's images to show that the two explosions were exactly in the same place. The most likely explanation for the 2004 explosion was probably an outburst of a very massive star like Eta Carinae, which was observed to have a similar giant outburst in the 1850s. The 2006 supernova was the final death of the same star. Dr. Pastorello said "We knew the 2004 explosion could be a giant outburst of very massive star, and we know that only the most massive stars can produce this type of outburst. So the 2006 supernova must have been the death of the same star, possibly a star 50 to 100 times more massive than the Sun. And it turns out that SN2006jc is a very weird supernova - unusually rich in the chemical element helium which supports our idea of a massive star outburst then death." 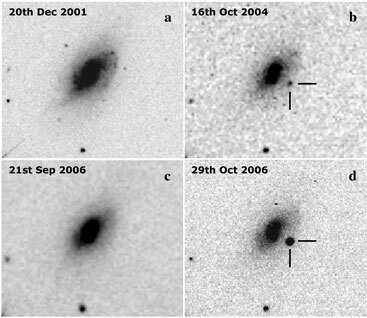 Dr. Pastorello used UK telescopes on La Palma (the Liverpool Telescope, and William Herschel Telescope) in a combined European and Asian effort to monitor the energetics of SN2006jc. He showed that the exploding star must have been a Wolf-Rayet star, which are the carbon-oxygen remains of originally very high mass stars. Prof Smartt is funded by a prestigious EURYI fellowship to study the birth and death of stars. He said "The supernova was the explosion of a massive star that had lost its outer atmosphere, probably in a serious of minor explosions like the one Koichi found in 2004. The star was so massive it probably formed a black hole as it collapsed. This is the first time two explosions of the same star have been found, and it challenges our theories of the way stars live and die."